Custom beamer blocks for pros and cons? 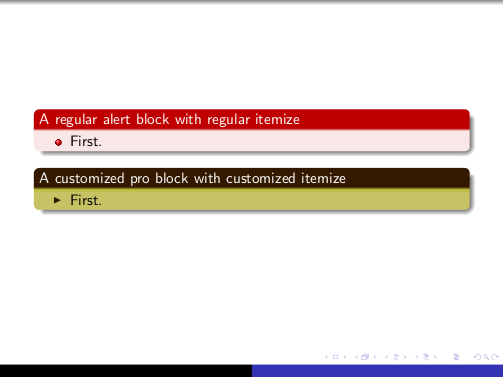 I want to be able to define custom block environments in Beamer. That is, where for now I use alertblock and exampleblock I would rather use problock and conblock for a pro/con discussion. This just seems more appropriate because a con is not an alert and a pro is not an example. For each defined block environment I would then provide the proper formatting overrides in the preamble such as bg, fg and especially the structure color for bullets and such. which would be the most beamer-like way to go? Not the answer you're looking for? Browse other questions tagged beamer color or ask your own question. How to modify itemize vertical spacing within blocks in beamer? How can I compile a beamer presentation with pauses in same page? Beamer: how to use \alert in itemize inside a block?